Despite the terrifying news hope is never lost and a mother finds the will to keep fighting on, especially when it comes to her child. Thanks to modern science and medicine a glimmer of hope was available but it was available miles and miles away in Philadelphia. Emily flew up to C.H.O.P. and a procedure was done where they inserted faux fluid into her womb and preformed one of the many surgeries Eli would have to endure in his life. They were able to insert a shunt into his bladder hoping that this would allow urine to pass through and create the life giving amino fluid needed to help develop him. Hope was restored and faith strengthen that day. All was good until her next doctors appointment when another ultrasound produced the same terrifying news. The shunt was not working and her amino fluid was way too low to keep him healthy. Calls were made and tickets were bought and another surgery was performed. The original shunt had actually been pulled in and so another was inserted. Scary and still full of hope we (my sister, mother and I) began planning the baby shower. News was great the stint was working and her belly was growing. News was good for a few weeks until, yet another ultrasound produced the blow that would have made most give up. The shunt was not working his kidneys were not producing fluid to keep him developing and the chances that she may deliver a still born or a baby that would only be alive long enough to meet his parents were HIGH! Emily and I must add her soon to be husband and Elijah’s father were into deep and were not ready to throw their hands up. Many more calls were made and tough decisions were pondered and history was setting the precedent, Emily would fly back to Philly, she would have to stay and have Eli up there and they would perform a 3rd surgery (which had never been done before) When she got there they did not perform another surgery but they did add more fluid and kept her on strict bed rest. I know I am missing a few steps but these are the key points. I know she had to have the urine taken out of Eli’s belly and test’s done before they would preform the surgery. And, I am sure that she had other procedures done that I just can not recall at this time. BUT…. Elijah was born on November 11, 2009 (5lbs 6ounces) – but his lungs were not developed and he would begin his life in the NICU unit. His third surgery was performed and they removed the stint and then had to remove the stint that had been sucked into his abdomen. The ultrasound produced the his kidneys were not functioning well and he had many cysts in both of his kidneys and this was not allowing urine to pass through. Another surgery was performed where they connected his bladder to the outside, with an incision right below his belly button where the urine would be able to pass through. They did keep one kidney hooked up the correct way so he does have a little bit of urine that comes through his baby man part and the rest through the hole. After a month in the Philadelphia children’s hospital he was finally stable enough to be transferred down to the All Children’s Hospital in St.Pete Florida. So he was able to come home on his own private jet. I finally get to meet this bundle of joy. He spent another month in the hospital here, and then the day came that Emily and Lee would be able to bring him home. Home. Home. Elijah’s life will consist of LOTS of visits to the hospital and doctors office and he will need a kidney transplant at some point. I “THINK” that his diagnoses right now is acute renal failure. Don’t quote me on that. "this is the one I want"
It has been 7 months. 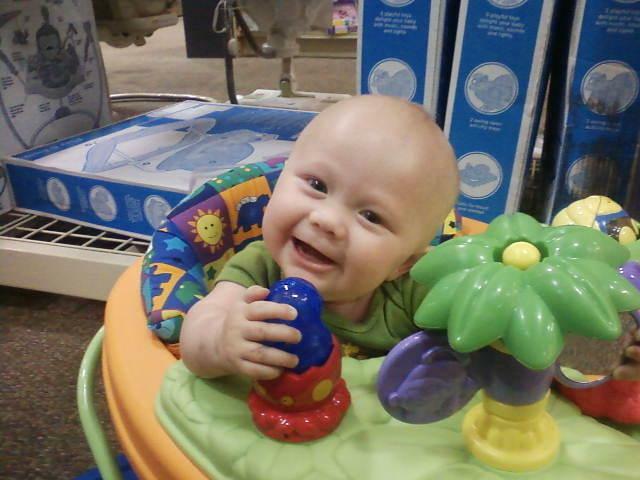 Elijah now 9 months old has had a great run and has not been back to the hospital except for his weekly check ups. Just looking at him you get this false since of “Everything is alright” He is a little smaller then most babies his age but otherwise he is smiling and alert and doing all the things everyother baby does. But like with all false reality there is reality; his mother decided to take him to her hometown to visit her family in Indiana. After she got off the plane she had a voicemail from Eli’s pediatrician that she needed to take Eli to the ER right away for his labs were off and indicating that his kidneys are failing. He is now at Riley Children’s Hospital in Indianapolis and being stabilized enough so that they can once again medevac him home, well to All Children’s hospital and another chapter of his short life will begin. Dialysis may be his next adventure… I am now waiting to hear. 9/3/10 – Baby Eli only has a UTI at this time! Weird for that to be good news but in this case it is. He will be leaving the hospital in a few days so his mom and him should still be able to enjoy a few more days of vacation before having to return home! Eli our little fighter! I went and picked up Elijah and him Mom from the hospital yesterday. They had been there for 2 weeks. That UTI he had in Indiana never cleared up and so 102 fever sent him to hospital and there he stayed. Since he was in the hospital already and wasn’t gaining weight at the rate they are looking for, he had his 2nd surgery. They attached a feeding tube to his stomach. He did gain 2.5 lbs while in the hospital and the chunkier he gets the cuter he gets! Him gaining weight is So important for him, so that he can reach mile stones like sitting up and crawling. And more surgery’s. I guess the plan now is to get him to 22lbs so that he can have his Kidney transplant surgery. For those of you who may be interested there is a foundation that supports kids like Elijah. Well, it has been a crazy few months for little Eli! I’m pretty sure he spent more time in the hospital since September than out, but he is out for now. It all started when I wrote this, infection (UTI) – then another and another.. they performed surgery to try and re-plumb some of his plumbing thinking that he may have had some pockets holding urine stagnet causing the infections. He also, was given another ooohhh can not think of the correct word and I wouldn’t know how to spell it anyway… but he had to have a procedure where they attach his bladder to the outside…. well, kinda so anyways… he has been feeling good for a week now and hopefully that will continue on. He does have to make another trip in next week, he has a feeding tube and they need to replace his tube with a mickey button. I’m sure that half of this is backwards but that is how I understand it. We were able to celebrate his one year of miracles and that is amazing in it’s self! This is such an amazing story! I hope all is going well for little, Elijah now.